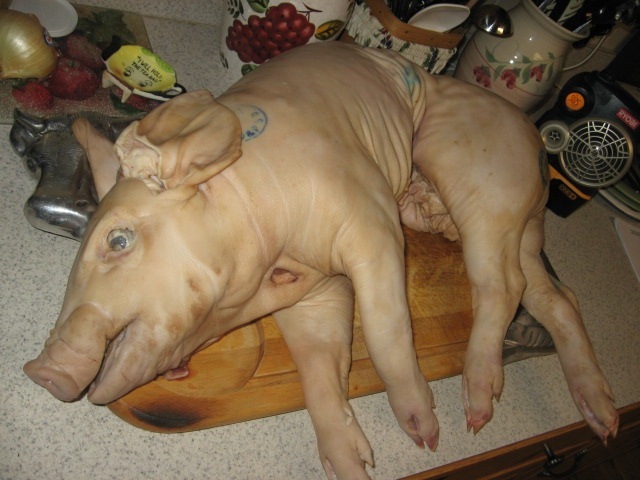 This whole pig recipe comes from one of my readers, Steve from Atlanta, GA! 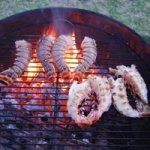 He submitted all these photos and info about how he cooked a Christmas Pig after getting some tips from this website. This isn't quite a suckling pig as it was about 30 pounds but its not an adult whole hog either. I guess you'd call it a juvenile hog. He cooked it on his Weber grill rotisserie and had to truss it up and counter weight it specially so that it would fit. Here are his notes on how he did it. I think he makes some good points and it looks like it turned out beautifully! 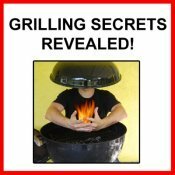 I found your site when searching for tips on cooking a whole hog. The whole pig went well! Folks were very happy and impressed. Most of all they were well fed. Thank you for your informative site. I cooked a 29Lb pig on my (24" wide) Weber Grill/Rotisserie. It took my equipment to the limit. 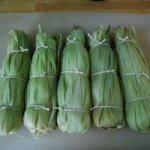 My doctor spoke about brining during Thanksgiving time and I was interested. He quickly pointed out the challenge of submersing a 29Lb pig into liquid in terms of quantity of liquid and size of container. I came up with an idea: I placed the whole pig in a heavy duty contractor grade 6ml plastic trash bag. I added salt, 1/2 gal of apple juice, 1/4 gallon of pineapple juice and pineapple chunks into the bag with the pig. While leaving the bag unsealed, I placed it into a cooler filled with ice water. The ice water pressed the bag up against the pig and minimized the amount of required brine. I placed the cooler on wheels so I could roll it outside to drain. This is the 30 Lb. hog, in a plastic bag, floating in the brine. (The bag was placed in a cooler filled with water & ice). 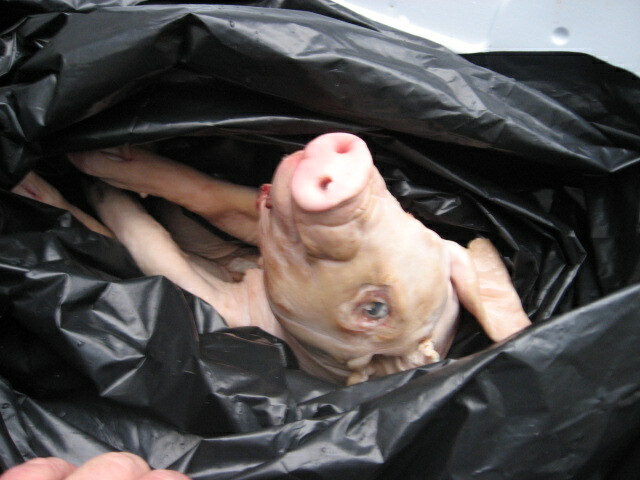 This is the hog just after removal from brine and before he was skewered. The pig roast went well (again thanks to your info). I had to hunch his back up a little which shifted the center of balance. I had to add several 12oz lead fishing weights as counter balance and cooked him the night before the party. Editor's Note: Be careful about taking this advice regarding any lead items when cooking. Lead is not safe for consumption. One reader informed me that heat, fat and acids from the cooking can accelerate the leaching of lead from the metal, possibly getting into the food. In other words, using anything lead or containing lead is probably best avoided! The weights as counter balance is a good idea if needed, but try to find something made from stainless steel or cast iron. The hog required counter weight. 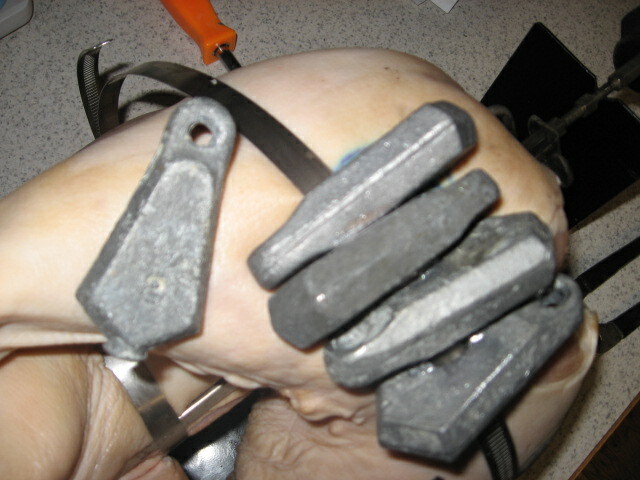 I used 12oz sinkers. This is the hog just before he went onto the rotisserie. (Ears covered with foil to prevent burn-off) The Stainless Steel hose clamps are available at my local hardware store for about $2.50 each. They are much more reliable and faster than butchers twine. I used a cordless screw driver to unclamp the hog-very fast method. This is the hog during cooking. I'm using a standard Weber Grill and Weber Rotisserie. I had to prop the lid open and remove the "flavor bars" (Stainless Steel angles that burn off drip before it gets into the burners) to allow enough room for the hog to turn. This is the hog when he came off of the heat. 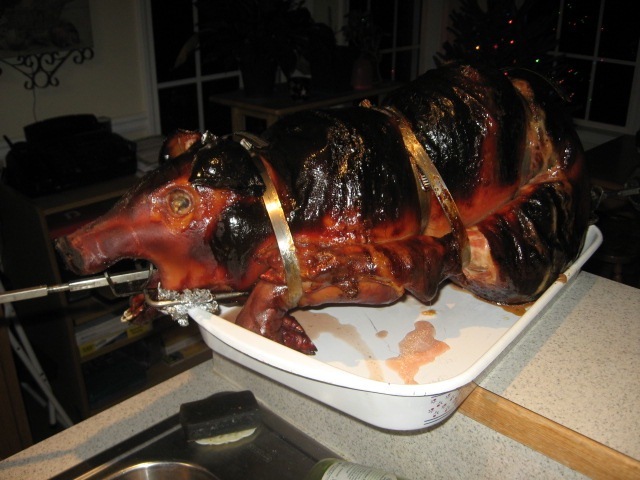 I cooked the hog until it reached 150-160 degrees F. (When I arrive at the party the following day, I planned to cut the meat off, place it in a foil pan [placing the skin and foil over top of the meat] and heat/finish cooking it prior to serving). The next morning set the whole pig on collard greens, over red foil, into a tin pan and over a large cutting board. 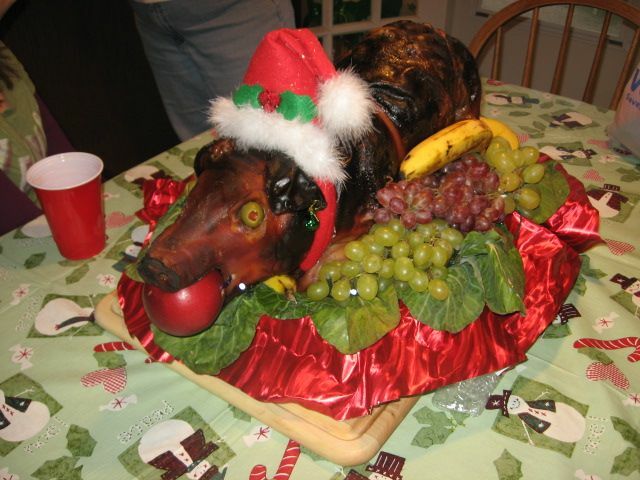 I decorated with grapes and used green olives (with red pimentos) for eyes. I weaved a small string of battery powered blinking led lights into the collards for a festive look. On his head, he wore a Santa hat and had a red apple in his mouth. The apple kept falling out so I used an electrical wire tie to secure the apple. These two were the hog prior to wrapping it up for transport to the party. I used olive for the eyes and had to tie the apple in using a plastic wire tie. Once the presentation was ready, I laid two 1/2 gallon milk cartons on their side and placed everything on top. I then wrapped Saran Wrap around everything to make sure nothing moved during the ride to the party. 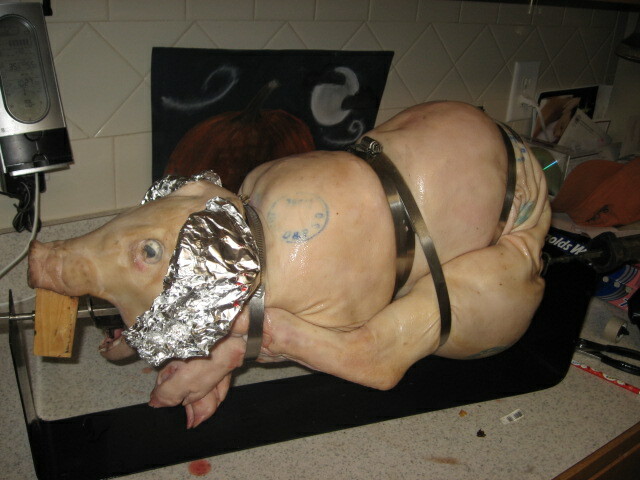 I used two milk cartons to suspend the hog for plastic wrapping. 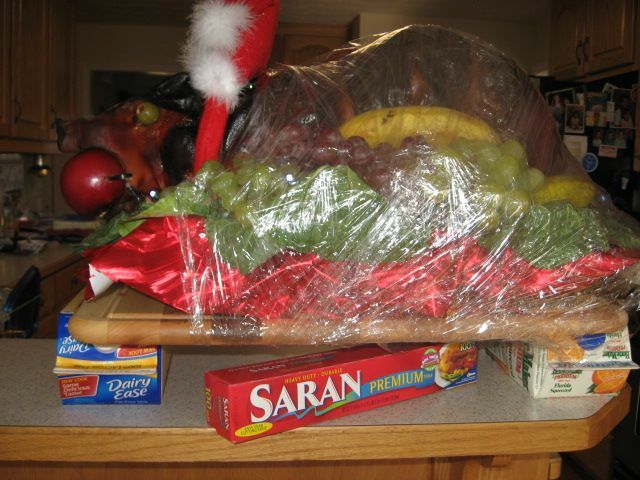 The wrap held all of these things together: The hog, collards, grapes, red foil wrapping paper, foil pan (that had a Ziplock bag concealed in it containing four pairs of surgical gloves for future meat cutting) and a large cutting board. 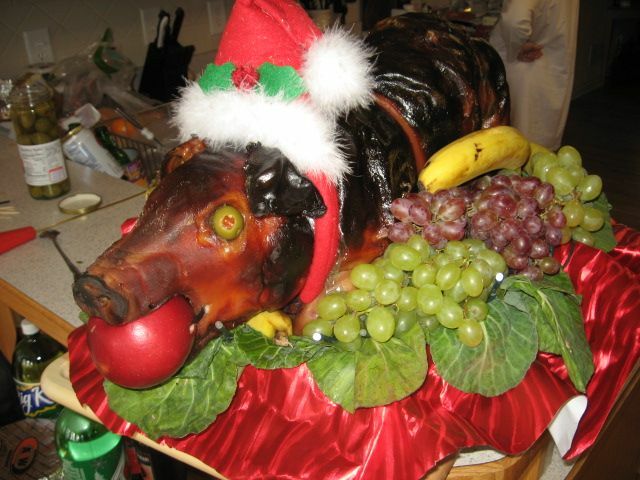 This was how the hog looked at the party after transportation. Note the Saran Wrap tucked under the red foil and the green Christmas ball ear rings. Once everyone got their pictures & it was time to eat. I got a volunteer to help me pull the meat off, slice it up, lay it in the foil pan and cover with the skin and some foil. We heated it in the over at 350 degrees F for 45-minutes. The meat was served with four 'over-the-counter' flavors of bar-b-queue sauce, rolls and sliced tomatoes. The group of 16 people ate this entire 30 Lb. hog! Thanks again for all your help and Happy Holidays! 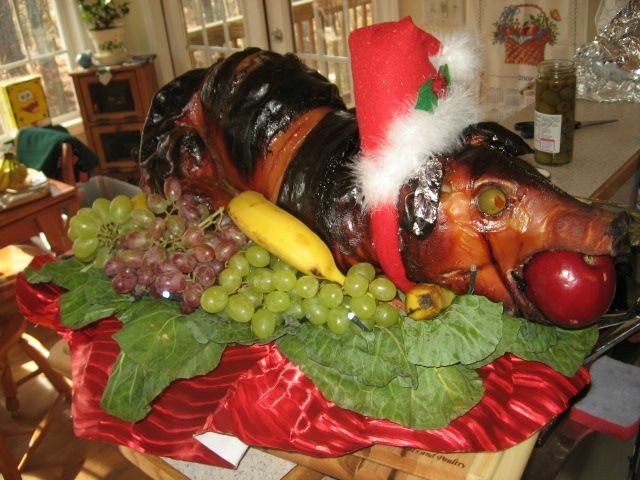 Thank YOU Steve for this great info on cooking a whole pig and have a wonderful Holiday Season! Done with this Whole Pig Recipe? 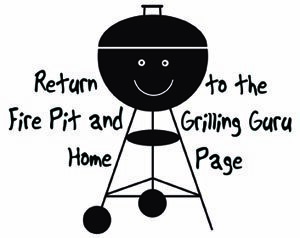 Return to the Whole Pig Roast page.